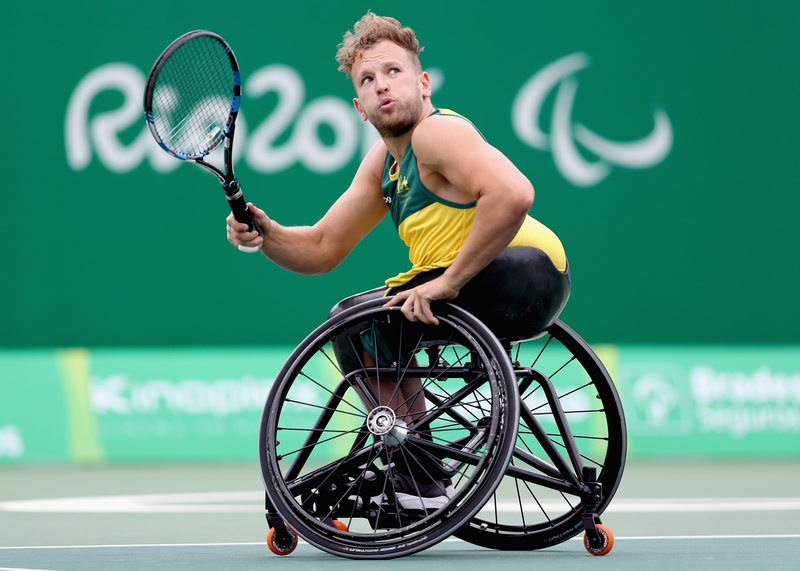 “Quite early on we realised that the standard architecture of the wheelchair tennis chair that Dylan was using would not allow us to create a performance-based interface between the athlete and the frame,” Crawford said. The team was also working with the challenge of creating a seat that minimised pressure injuries, which can result in skin breakdown and even muscle damage, which has the potential to put an athlete out of competition for several months. Dylan Alcott is a Paralympic champion in basketball and tennis.For the design team, this meant creating a custom carbon fibre seat, which was moulded to Alcott’s body shape, and then working out the correct shape and density of the cushioning that was required in different areas of the seat. “For example, certain parts of the cushioning at the bottom are softer than others. So where he needs support, he can get support — because that’s a distinct performance advantage — and areas that he needs the pressure of his skin managed better, those areas are cushioned more,” Crawford said. AIS Senior Sport Engineer Matt Crawford.In order to work out where the pressure points were, the team used a pressure map, similar to what is used in automotive and aircraft seating and the disability sector. This technology creates a map of pressure across the area of contact, which gives insight into areas that must be unloaded and those that can be loaded. Once the seat had been designed, the team used data, technology and engineering to fine-tune the wheelchair designs, trying to make them more agile while also ensuring that they maintained the ultimate balance required. For example, moving the centre of gravity in the wheelchair has a significant impact on the wheelchair’s stability and how it turns. The aim is to make it as agile as possible. But this can be a balancing act. Through testing with Alcott and other athletes, the team discovered that a wheelchair can turn too fast, scrubbing speed off when the athlete is trying to change direction and get to the ball in wheelchair tennis. The team also experimented with moving the centre of mass up, down, forwards and backwards to tailor to Alcott’s liking how the chair performs. “It took quite a while. There were lots of days where he didn’t like it,” Crawford said. The team also played around with the height and angle of the seat to get better propulsion. The result is a seat in which, when Alcott turns his upper body, the wheelchair turns with him, meaning he wastes less energy when he’s competing. The AIS team used aluminium for the frame and carbon fibre for Paralympian Dylan Alcott’s wheelchair seat. One reason was that when an athlete travels on their own, they need their wheelchair to be light so they can get it to and from an event. In the case of an overseas event, wheelchairs can be damaged during a flight, so the wheelchair also needs to be easily repaired. “For example, if Dylan went overseas and the frame was bent or broken, if it’s aluminium, it’s easier to get repaired. But if it’s made out of carbon fibre or titanium, which you could very well do, it could be very difficult to repair, so there is always a trade-off to consider,” Crawford said. Alcott can produce a reasonable amount of power and is a very competent wheelchair operator, so the aluminium frame was chosen because it could be repaired in the event of damage. The AIS and the Australian Paralympic Committee are currently working closely on identifying talented athletes who are either podium-ready, or have the potential to be, across various Paralympic sports. 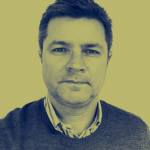 Crawford has also been involved in designs for these other sports, such as a prototype rowing seat for Erik Horrie, an athlete who recently competed in the para-rowing world championships in Bulgaria. Depending on the class of rowing, para-rowing might not have a classic rowing seat, which moves. For Horrie, who races in an arms and shoulders class, his lower body is not allowed to move at all. AIS Senior Sport Engineer Matt Crawford. Like Alcott, the seat design had to consider pressure injury, so a customised seat was required that kept the athlete in the right position for performance and also looked after his health. “A few of the challenges are understanding what the coach and athlete are asking for and then building the seat,” Crawford said. This process included doing a digital scan of the athlete sitting in his rowing position. A latex bag with a fine medium inside was used to take an impression, which was then 3D scanned. This data was then used to create a 3D model, from which a working prototype was produced. Working with the coach and athlete over a period of time, a few iterations were created, which were tested until a final design was selected. This design was then built in prepreg carbon to have the required shape, as well as the highest strength-to-weight ratio. Crawford said developing designs like this and working in the para-sports space is fascinating work. “There are some really exciting challenges and projects of trying to make something better than you’ve already got,” he said.